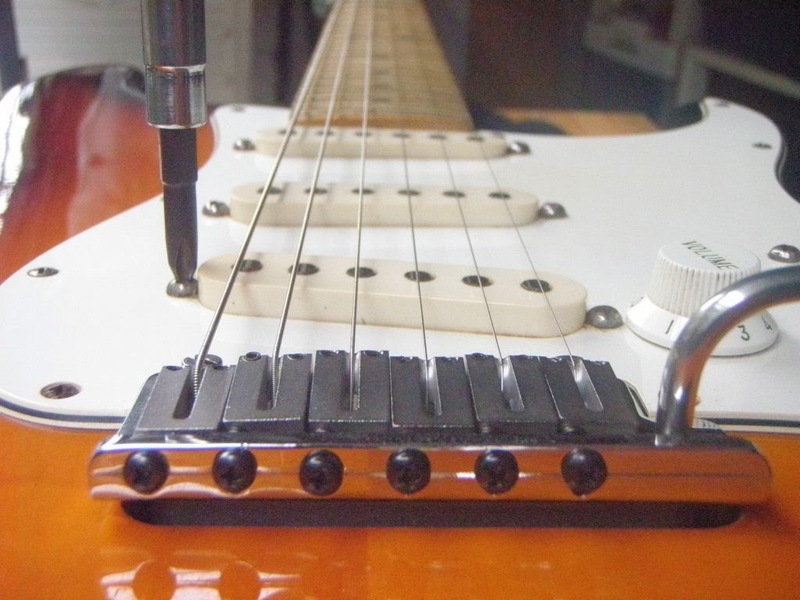 Today we’re going to have a very quick look at pickup setup for a Fender Stratocaster-style guitar. 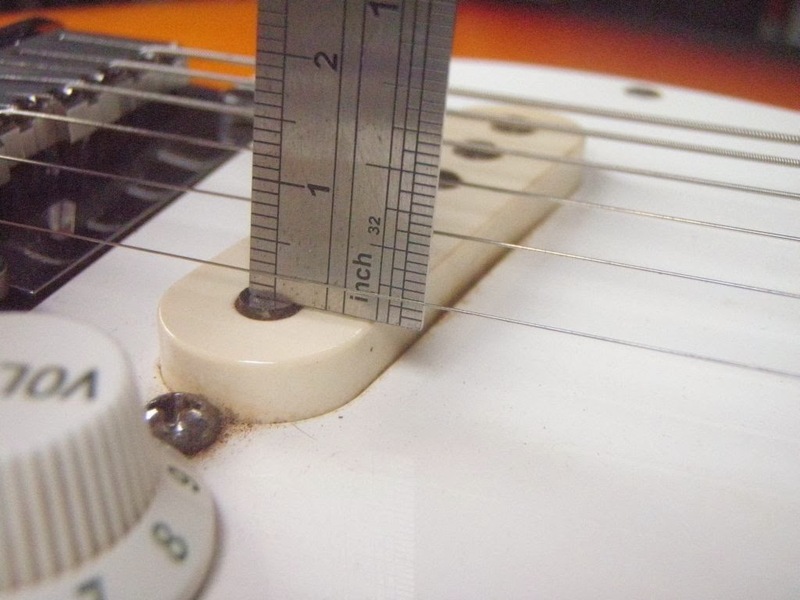 Adjusting the pickups on a Strat couldn’t be much easier and the only thing that really requires much consideration is what height to set them at. You’ll need two tools for this: a Phillips screwdriver and a ruler (ideally one that measures right to the end). Before measuring any pickup heights, press down on the low E string at the highest fret. 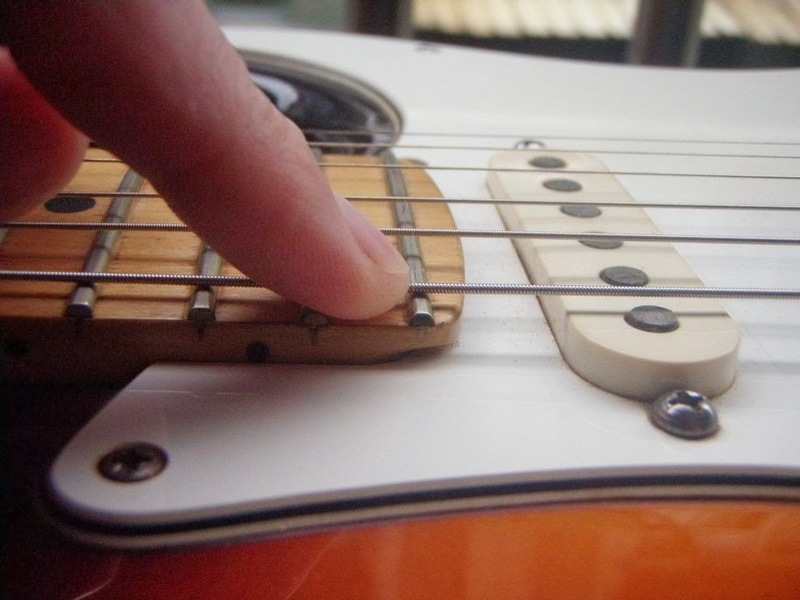 With your finger still pressing down on the string, measure the distance from the bottom of the E string to the top of the pole piece (pickup magnet) directly under that string. 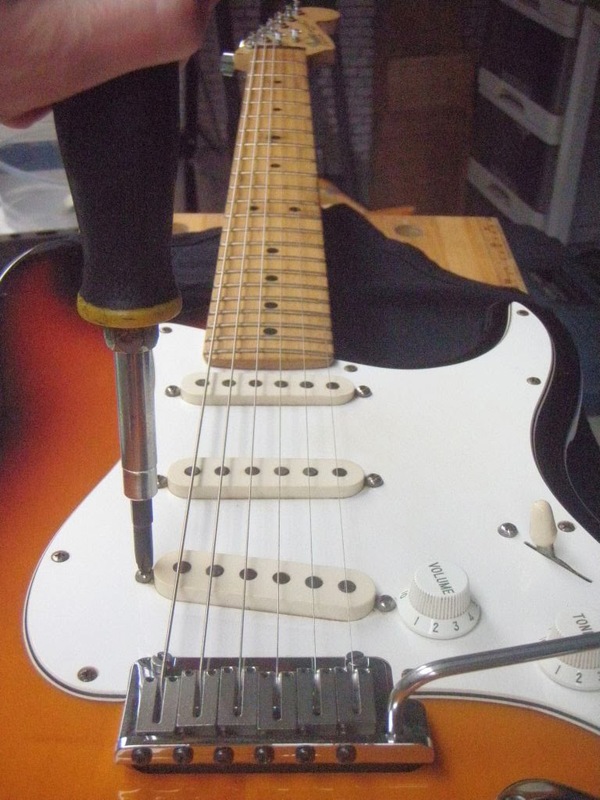 If you need to adjust any of the pickup heights, then to raise the pickup (thus reducing the distance from the pickup to the string), turn the screwdriver clockwise. Similarly, to lower the pickup, turn it anti-clockwise (counterclockwise). Now repeat for the thin E string, remembering to press down on it at the highest fret before measuring. feel free to adjust slightly to your own tastes. 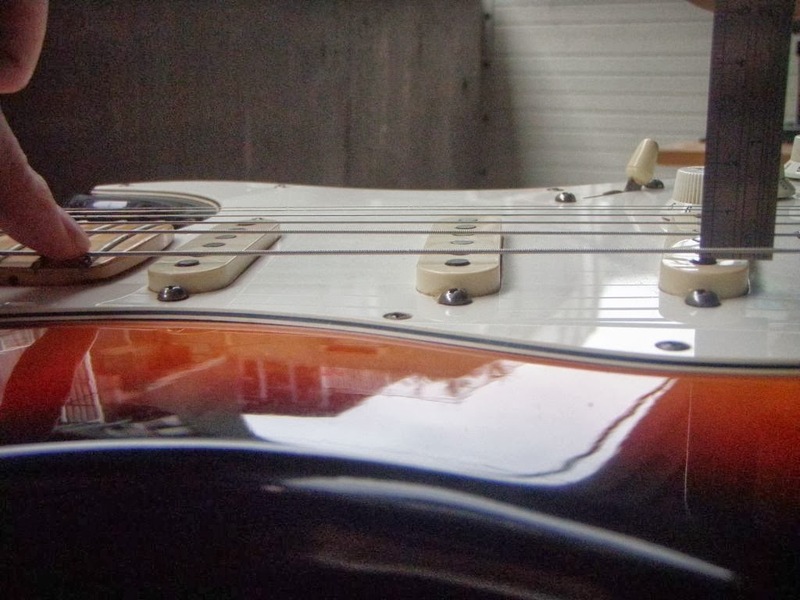 However, note that adjusting the pickups so that they are too close to the strings can be problematic, as the magnetic fields produced by the pickup start to pull on the strings. What is a good pickup hight for a Strat with EMG DG 20 pickups? Thanks! Thanks for this. Essential info for several pickup heights in one spot. I have the worst time trying to remember Fender recommendations for setting their pickup heights. I just bought a Squier Strat the other day, I realize it's the "bottom of the barrel" but, I'd like to set it up, I've been reading the posts you've put up, here's the question: my guitar has pickups with pole pieces all different heights, almost as if the pole pieces are following the string radius, is this something special to this guitar, is it something that is wrong, or ... what? Hey Jeremiah, that's a GREAT question and I'm surprised no-one has asked it before. 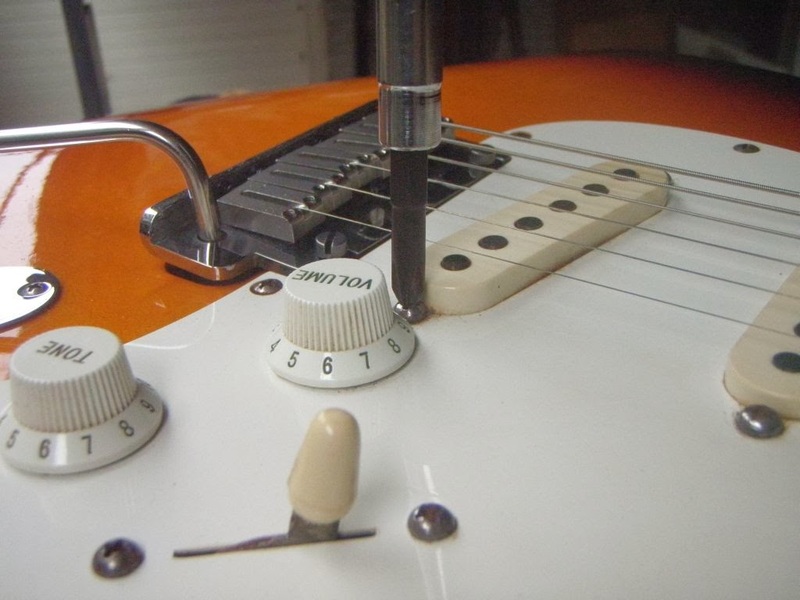 It sounds like you have staggered pickups, which are adjusted in an effort to better balance each string's output ( whether or not this is better is debatable--see here: http://menga.net/understanding-flat-and-staggered-pole-pieces-in-pickups ). There's certainly nothing wrong with what you've got. Oh, and nothing wrong with Squiers! Thank you so much for all your advice and help! I'm 60 and always wanted to learn to play electric guitar and I am totally new to all this guitar stuff. My son gave me a Fender Bullet Strat for Christmas and I love it but it seemed a little big for me ( I'm only 4'11 with small hands). So I found the Squire Mini and it is perfect! The only thing that I don't like about it is that it does not have a tremolo bar. Can one be put on the Mini? I am very good at DIY and I'm hoping I can do a little modding to my Mini. I have 5,0mm on the low E and 3mm on the high E (Single coils). And on my humbucker (Seymour Duncan SH4) 4mm on high and low E.
OK here is the deal with me I see the plows are fairly flat in the stray you are adjusting. They are close to the new pickups I just installed. They are not near as staggered as the previous set I had in ... So is there a difference in height adjustment? My Strat is my main stage axe. There is a lot of room for adjustment when it comes to single coils, the most common. A lot has to do with the sound you are after. Bringing the poles up gets you a fatter sound but you do have to watch for stratitis and a booming bass. On the other hand taking your pick ups to the deck gets a cleaner but thinner sound. I use a combination of heights and do not set mine perpendicular to the guitar body.If you watch players on Television you will see all kinds of pick up heights. There is no absolute right height. A lot depends on what your amp can do and the sound you are looking for. Your guitar and amp are a system. Hendrix dropped one end of his pick up to the deck and pushed the other to the top at a crazy angle. Even every Strat is different. No one right answer.